As you may have gathered from our name, we aim to offer the best prices for insurance and investments on the market. We believe that cheap insurance means cutting the cost, not the quality. Insurance and investments should be affordable for all, which is why we work hard to keep ours at the best price. For everything from Home Emergency Cover to Motor Legal Protection, we offer cover from as little as £9.99 a year. That’s less than the price of a meal out! We also work to be as transparent as possible. Our structured products page contains a calculator that will let you see exactly how much our fees are upfront. We also detail precisely what is covered in all of our insurance, so you will never be caught out. Here at Best Price FS, we work to save you money. When investing in structured products, you may notice that other financial advisors keep the cost of their arrangement fees hidden away. 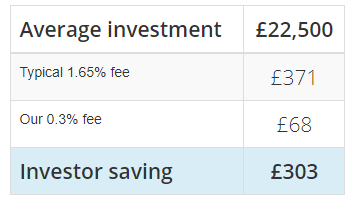 The average arrangement fee is around 1.65% which is 1.35% higher than our arrangement fee here at Best Price FS. We believe you should reap the full benefits of your investment, and so we require just a small fee to arrange it for you. To see just how much our cheap arrangement fee will save you, here is an example. Some financial advisors even charge up to 3% to transact Structured Products on a non-advised basis. In this scenario, taking out a structured product with Best Price FS will save you over £600. Click here to browse our full range of low arrangement fee structured products. If you get into an accident that’s not your fault, it can cost a lot of money to reclaim your uninsured losses. With the cost of legal representation and a courtesy car, it could set you back hundreds of thousands. However, here at Best Price FS, we cover you for up to £100,000 for just £9.99 per year. We work to provide the cheapest insurance on the market that’s accessible to all. Find out more about our Motor Legal Protection here. Our Home Emergency Cover protects you from boiler breakdown to pest infestation. Every home should be a safe place to live and our Home Emergency Cover provides that to homes across the UK. Compared to some of the biggest names on the market, our Home Emergency Cover can save you over £150. Here’s how we compare. If you’ve decided to forgo any emergency cover, taking our Home Emergency Cover with us can save you hundreds. For example, a boiler breakdown alone can cost you in excess of £150 for minor damage. If numerous emergencies happen throughout the year, this will cost you well over £91.25. This is why we believe our Home Emergency Cover is one of the best prices for insurance. Click here to find out more. We work hard to ensure you as the consumer get the best price for insurance and investments because we care about our customers. To find out more about any of our products, just head to our website or you can contact us here.